(626 – March 17, 659) was abbess of the Benedictine monastery of Nivelles, in present-day Belgium. Patron of Cats, the Recently Diseased, Gardeners, Travelers, Those with Mental Illness, and Those with a Morbid Fear of Mice and Rats. She was a daughter of Pepin I of Landen, and a younger sister of Saint Begga, Abbess of Andenne, Saint Bavo and Grimoald I. One day, when she was about ten years of age, her father invited Dagobert I and some noblemen to a banquet. When on this occasion she was asked to marry the son of the Duke of Austrasia she indignantly replied that she would marry neither him nor any other man, but that Jesus Christ alone would be her bridegroom. After the death of her father in 640, her mother Itta, following the advice of Saint Amand, Bishop of Maestricht, erected a double monastery at Nivelles. She appointed her daughter Gertrude as its first abbess, while she herself lived there as a nun, assisting the young abbess by her advice. Among the numerous pilgrims that visited the monastery of Nivelles, there were the two brothers St. Foillan and St. Ultan, both of whom were Irish monks who had lived c.633-651 in East Anglia, and were now on their way from Rome to Peronne, where their brother St. Furseus, lay buried. Gertrude and her mother gave them a tract of land called Fosse on which they built a monastery. Ultan was made superior of the new house, while Follian remained at Nivelles, instructing the monks and nuns in Holy Scripture, and was later murdered there by bandits. After the death of Itta in 652, Gertrude entrusted the interior management of her monastery to a few pious nuns, and appointed some capable monks to attend to the outer affairs, in order that she might gain more time for the study of Holy Scripture, which she almost knew by heart. The large property left by her mother she used for building churches, monasteries and hospices. At the age of thirty-two she became so weak through her continuous abstinence from food and sleep that she found it necessary to resign her office. After taking the advice of her monks and nuns, she appointed her niece, Wulfetrude, as her successor, in December, 658. A day before her death she sent one of the monks to St. Ultan at Fosse to ask whether God had made known to him the hour of her death. The saint answered that she would die the following day during Holy Mass. The prophecy was verified. She was venerated as a saint immediately after her death, and a church was erected in her honour by Agnes, the third Abbess of Nivelles. The towns of Beverst (Belgium), Geertruidenberg (Breda) and Bergen-op-Zoom in North Brabant honour her as patron. She is also patron of travellers, and is invoked against fever, rats, and mice, particularly field-mice. There is a legend that one day she sent some of her subjects to a distant country, promising that no misfortune would befall them on the journey. When they were on the ocean, a large sea-monster threatened to capsize their ship, but disappeared upon the invocation of St. Gertrude. In memory of this occurrence travellers during the Middle Ages drank the so-called "Sinte Geerts Minne" or "Gertrudenminte" before setting out on their journey. 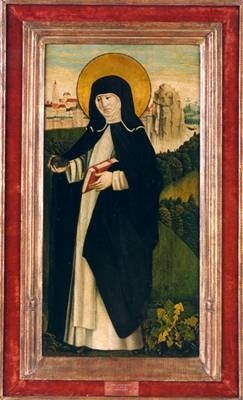 St. Gertrude is generally represented as an abbess, with rats and mice at her feet or running up her cloak or pastoral staff.